They say a change is as good as a holiday, and with negative edge pools you can turn your backyard into a tropical resort! Designed to appear as though the water continues on indefinitely into the horizon, they are the perfect choice for anyone with a sloping block or spectacular views to take advantage of. Why choose negative edge pools? 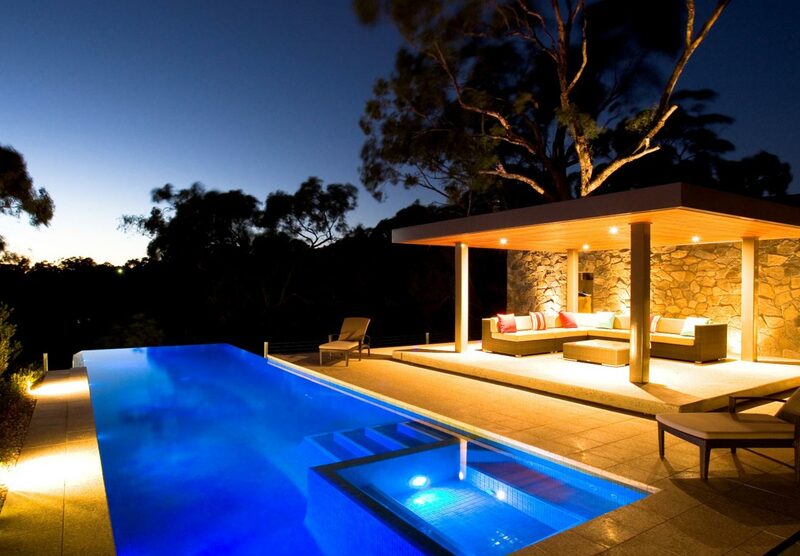 People choose negative edge swimming pools for the look and prestige that they offer. Often used in luxury resorts and hotels, installing a negative edge shell on your property is the ideal way to bring that glamour into your home. Their clever design ensures the water is continuously flowing into the distance – though in reality, it’s simply cascading into a lower basin before cycling back into the main pool. The pool coping is set a few millimetres below the water level, which allows the water to spill over into a catch basin which has been installed at the base of the shell. This water is then cycled back up into the main shell, creating the optical illusion. Will my negative edge pool need additional maintenance? Though the water looks as though it extends into the horizon forever, this optical illusion is actually the work of clever design and plumbing – this not only looks impressive, but actually leads to a cleaner, healthier pool as the water is constantly moving. What property do they look best on? We’ve found that negative edge pools look best on properties that are sloped, as their breathtaking view will blend in with the water for spectacular results. If you’re wondering if your property is suited to this style, contact our team today for our expert opinion. Are negative edge pools expensive? Whilst excavation and installation can cost more, the price tag is definitely worth it. Homes on a hill often have a stunning view that they can take advantage of, be it a lush forest, the neighbourhood or city below them, or even the ocean if they’re truly lucky! Based in Ravenhall, Coral Pools is proud to offer its professional pool building services to the western Melbourne region, including Deer Park, Derrimut, Laverton, Sunshine, Caroline Springs, Altona, Rockbank, Tarneit, Hoppers Crossing, Williamstown, Werribee, Point Cook and many more. Please contact us to see if we install negative edge pools in your area.